I've been closely following Brigid Kemmerer's books since her debut series. She's one of those authors that I will stop drop everything to read from despite my waning interest in YA lately. With every book, she only seems to improve. With A Curse So Dark and Lonely, she takes a stab at one of my favorite fairytales, Beauty & The Beast, and I'm happy to say, she nailed it. What sets this book apart from other retellings is that the heroine, Harper, is actually from the modern-day United States. She is captured and taken to the kingdom of Emberfall in the hopes that she will fall in love with the Beast and free everyone from the curse that has been plaguing this kingdom. What also sets Harper apart from other Belles is her cerebral palsy. I loved that the author included a heroine with a disability at the center of a fantasy novel. Her condition was very much a part of her, but Harper still managed to conquer whatever she faced. She was strong, brave and an absolute firecracker of a heroine. We also get to see how she struggled with the conflict of wanting to go back to DC to save her mother who is suffering from cancer and to save Emberfall. This conflict only became tenser as she began to know the people of Emberfall better. Her inner battle was realistic and had me considering what I would have done had I been in her place. I love it when a book can force me to put myself in a character's shoes. Prince Rhen, the aforementioned Beast, was also an interesting and complex personality. It was heartbreaking just how much the curse had shattered this guy and I was rooting for him and his happiness very early on. While his Beast form was undeniably intriguing to me as a reader, especially with the different and unexpected forms it appeared to take, it was the emotional toll that it had on Rhen that had me glued to the pages. Rhen was a sweet and honorable guy despite his grueling circumstances and the more we learned about him, the more I liked him. His guard commander, Grey, was also a well-written addition in A Curse So Dark and Lonely. His friendship with Rhen and his growing bond with Harper added an interesting dynamic to the story. I am looking forward to the sequel to find out more about him. 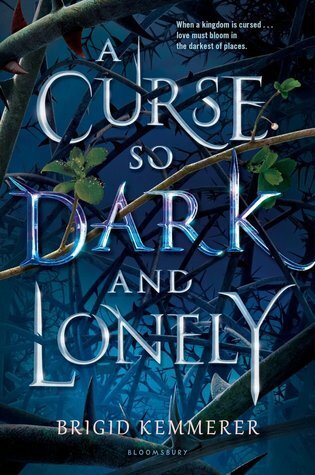 A Curse So Dark and Lonely stuck to its roots, but it still managed to come across as a fresh story as the author put her own spin on the tale. The backdrop of the fantasy world, the luscious writing, and the physical (and emotional) adventures the characters went on only served to heighten my enjoyment of the story. At this stage, I can say with utter confidence that Brigid Kemmerer is one of my favorite authors. She writes such spell-binding stories and A Curse So Dark and Lonely is no different. Make sure this one is on your TBRs. Have you read any fantasy novel with a heroine who has a disability?